PRESIDENT Emmerson Mnangagwa’s government is wary of mass protests and is working around the clock to create the much-needed jobs for the youths. This comes after the opposition led by Nelson Chamisa warned that the country could slide into total anarchy unless the thorny issue of youth unemployment is addressed. An estimated 10 percent of the country’s population is formally employed. In an interview with the Daily News, government spokesperson Nick Mangwana said they are laying the foundation for employment creation and pleaded with the opposition not to take the demonstrations path. “From the government side we are doing all that is in our power to ensure that Zimbabweans work. We are reforming in order to create an enabling environment for capital to feel comfortable. We are easing our way of doing business so as to bring efficiencies and cut out unnecessary bureaucratic delays. Regarding unrest and jobs it is very clear that the anarchy avenue is self-defeating in as far as job creation is concerned. “The last incitement to unrest we had in January left behind infrastructural ruins and a battered image of the country as a destination to foreign capital. So going down that road will surely not help anyone get a job or put anyone in power for that matter,” said Mangwana. On Monday Chamisa, who leads the MDC warned that Mnangagwa’s never ending foreign travels and his failure to create jobs is likely to create unrest in the country that is faced with drought and emerging from the ruins caused by a cyclone. “I am getting worried with his trips, it seems he is not appreciating the problems that Zimbabwe has, especially the young people. 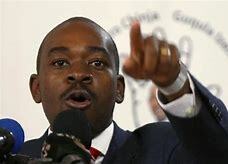 The plight of young people is a threat to the national stability, youth unemployment is a ticking time bomb that has to be resolved in the context of national dialogue and engagement,” said Chamisa. Mnangagwa, however, has since moved on, slamming the door on his opposition counterpart who has steadfastly refused to accept his legitimacy. Speaking at the just-ended Bi-National Commission Mnangagwa said: “We will not be swayed by negative forces because even the Lord upstairs was not able to keep his house in order — he had Satan. So, these things happen but He still remains there as the Creator” as he responded to questions from journalists on the progress of talks with the opposition that have been snubbed by Chamisa. However, in recent days Mnangagwa has come under fire for his penchant for travel and luxury as he charters a plane for his many foreign trips even in a sea of poverty. Chamisa is on record saying he will soon mobilise his legion of supporters to peacefully demonstrate against the Mnangagwa government that has failed to deliver on its electoral promises. Speaking of the January demonstrations that were only quelled by the intervention of the military, Chamisa has often indicated that the time will come when the opposition will organise crippling demonstrations to achieve its goals. “The ZCTU is the one that organised the very successful shutdown, but then the authorities thought it was us the children who had organised that mistaking a child for the mother but I can tell you when we organise it will be bigger, it is true there were some people who became violent but that does not take away the people’s right to demonstrate, unions world over are there to represent the people and the ZCTU did the right thing,” said Chamisa. Apparently, in preparation for possible demonstrations Mnangagwa recently revealed that his government will acquire anti-riot gear for the police.